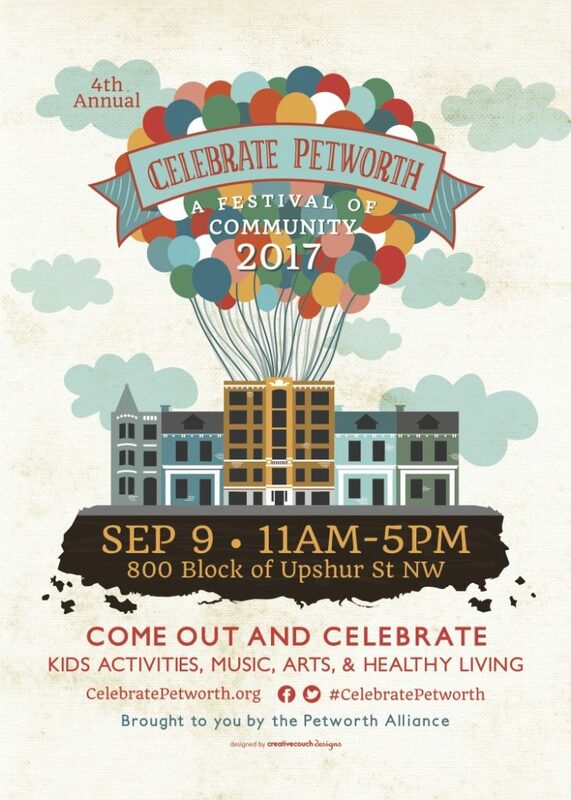 PoPville » Celebrate Petworth is Saturday!! “This Saturday, September 9, come out to the 4th annual Celebrate Petworth Festival! This is a free community festival celebrating the creativity, culture, and people that make up the Petworth community. The festival will run from 11am-5pm and will be on the 800 block of Upshur Street, NW. In addition to food trucks (listed below) and local vendors, there will be a music performances throughout the day, a dog show competition, 3×3 basketball tournament, and a 5K fun run! A Petworth History Tent will feature storytelling by local residents highlighting the rich cultural history, experiences, landmarks and historical milestones throughout the decades in Petworth. To top it all off, PetworthPalooza, a free concert running from 2 pm-7 pm in the Capital City Hydroponics gravel lot at 821 Upshur Street will feature 5 hours of music and $5 drafts from 3 Stars Brewery!